Brett Tippie and Greg Herbold sit down for some catch up and a little history lesson. 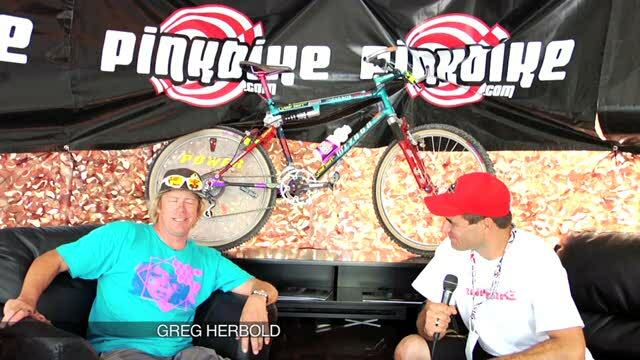 Greg "H-Ball" Herbold was inducted into the Mountain Bike Hall of Fame in 1996. Herbold, or HB, won the first UCI World Downhill Championship in Durango, Colorado in 1990. He won the NORBA National Downhill Championship in 1988, 1989, and 1993, and the North American Downhill Championship in 1991. He won the first dual slalom race at Mammoth Mountain in 1987. I love the early days of DH! Great site! The last time someone posted that it got deleted. Probably because it's not such a great site. Tippie, Simmons and Schley are being inducted into the Hall of Fame in Vegas. Well deserved boys - the original fro-riders. Awesome interview! Stoked to see coverage from the legends race! Lol great early bike, saw some early pics of Rob warner and Peaty on thier steeds ages ago, not that much different, Brett Tips the man got to love him, total legend to the cause cool interview.. I'm listening to Greg but I'm watching Tippie - he's a very upbeat and happy guy. He's an instant cure for depression. Hey what happened to the link for www.site.hbcutthecoursein1990.com ? Come on Pinkbike. Does anyone else find it scary that he owns a t-shirt that matches that bike? coverage on the legends race? Please tell me there will be some coverage of the old timer race! he sounds like kermit the frog ! Quality history lesson in mountain biking! I don't think he cheated. He won it and was awesome! I couldn't say if he cheated or didn't (I wasn't there). But I hate the fact that Pinkbike censors these pages. What are they afraid of? Let people check out the site if they choose and make up their own minds. It's better than reading 15 different renditions of "so sick." Pinkbike has done some heavy censoring on this page. he did a lot to promote early DH, and he was super fast none the less.